Contacts are a smart choice for individuals who are active and dislike the feeling of wearing glasses. However, the process of caring for contacts and getting used to them can take a week or two. Navigate the transition with ease by learning how to properly care for contacts and becoming familiar with common symptoms that occur when you first wear contacts. As with any new eye prescription, it may take a few days for your eyes and brain to adjust to the changes. New prescriptions may cause mild headaches or slight dizziness. If this persists after the first week, it may be a sign that your prescription needs to be adjusted. Talk to your optometrist immediately if you experience any of these symptoms. Contact lenses sometimes cause mild eye irritation during the first few days of use as you get used to the new sensation. You may feel uncomfortable that there is something in your eye or notice when your contact lenses begin to dry out. After a day or two, these symptoms typically go away. If you continue to experience eye irritation after a week, contact your optometrist for recommendations. Does the Type of Lenses Matter? 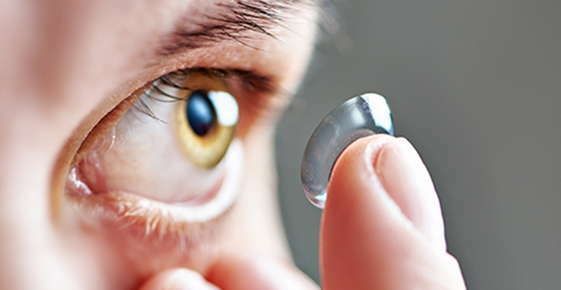 Most contact lens users start with soft lenses, which are flexible and conform to the surface of your eye. Individuals with certain eye conditions must use rigid gas permeable lenses, or “hard” contact lenses. These lenses may cause eye irritation or redness that persists for several days. Eye irritation and other side effects are more common with hard lenses than with soft disposable contacts. One of the most common causes of eye irritation is improper care for contact lenses. Always wash your hands before and after touching your eyes to avoid spreading bacteria. Lens manufacturers recommend cafefully rubbing contact lenses with your fingers and thoroughly rinsing them using a multi-purpose solution. Remember that rewetting drops, saline solutions, and tap water are not appropriate ways to clean your contact lenses. Always use fresh solution to store your contacts overnight. Reusing contact solution may cause eye irritation or infection. Following the proper disposal schedule also helps you adjust to wearing contacts and keeps your eyes healthy. Ask your optometrist for more specific recommendations about your contacts. Contact Lens Manufacturers Association (CLMA), "Frequently Asked Questions."